Late in the day at Aftershock, while waiting for the next act to appear on stage, I realized that I had not seen one woman on stage during the whole day, and commented out-loud. One of the "pro" photographers, and by pro I mean someone who makes their entire living shooting music, not just a small part of it like most of the music photogs I know, well, he looked at me as if I was stupid, and asked me if I'd listened to rock/metal before. Good grief. Agreed. There have never been so many women in the heavy-metal rock world that no-one notices or cares to comment. Not so many. Rare. But none at all, on a full-day festival? It was comment-worthy, at a minimum, if not protest-worthy! Not one woman. No bassist, drummer, guitarist or singer. It was an all-male show. And really, truly, what does gender matter when the music is good? It's irrelevant. Seriously. Like colour of skin, and sexual preference, and what you ate for breakfast are irrelevant too. It's the music that matters... but while statistically, there are far fewer women than men, zero women is clearly not a good representation of the truth. First on stage was Fair Struggle, local Sacramento band, with Meg Morrison. 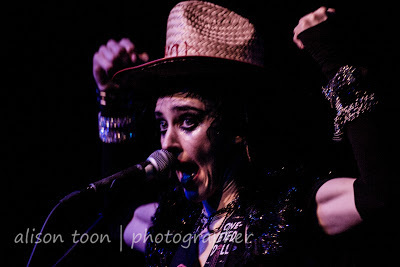 True rock, great stage presence, and I'm sure she could cover a Janis song easily and make it her own. She has that kind of voice. Then... One-Eyed Doll. Oh my. The guy at the merchandise stand told me I was in for a treat... and he was so very right. How can a two-piece band light up and rock a crowd like that? From the opening, little-girl "Hello, I'm Kimberly!" through the blood-curdling lyrics and audience-participation chants ("Serial Killers are Human Too! Serial Killers are Human Too!) to Junior's insistent drumming and Kimberly's guitar-playing-while-performing-a-contortionist's-moves to "Sacramento, Texas!"... Wonderful show, wonderful performance, both musically and theatrically. Two people, but with the presence of many more. 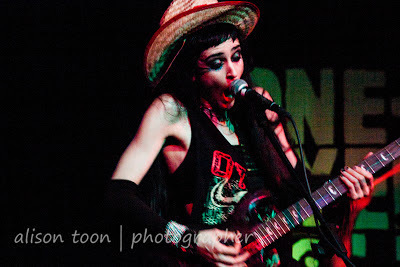 Perhaps it was the many personas of Kimberly that did it; cowboy and pope, little girl lost and big bad witch. And then, Otep. 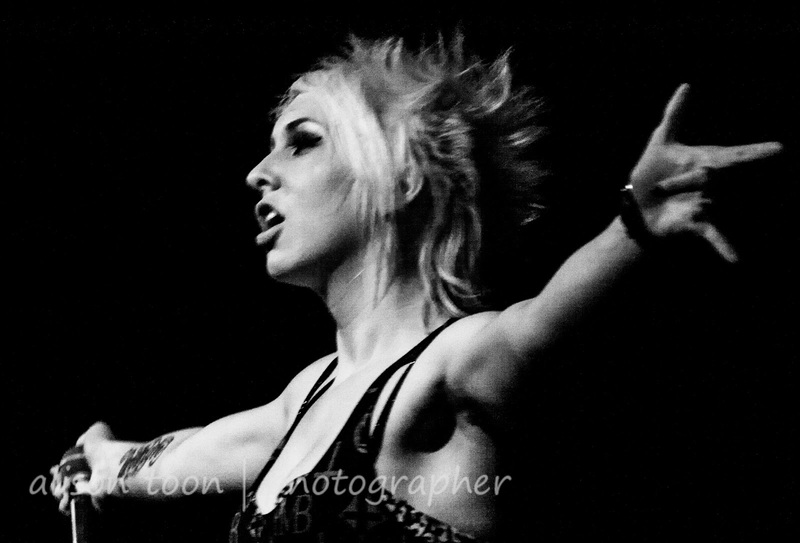 I'd been wanting to see Otep since learning that Aaron Nordstrom toured with her before Gemini Syndrome began. And headlining the show was Otep: outdoing One-Eyed Doll was going to be a challenge, but if there's any woman today who could (and should!) take the stage at a heavy metal festival, it's Otep Shamaya. 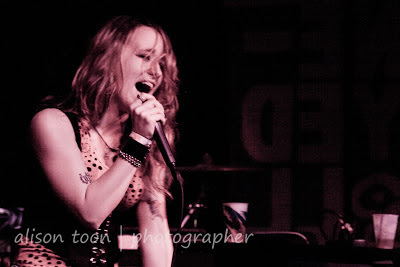 Her lyrics can be fierce, harsh, and brutally disturbing; her voice is a guttaral scream, or an angel song, or a whisper. 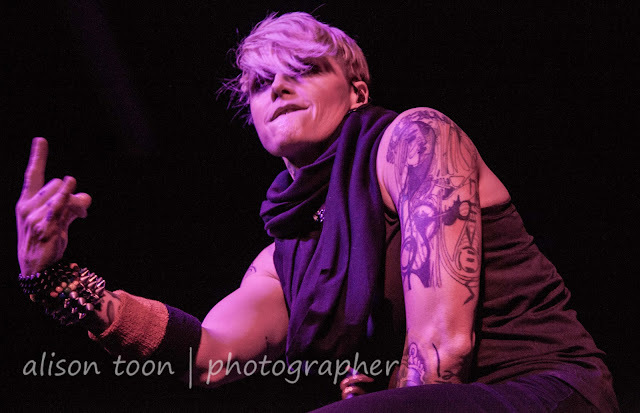 Nothing mild or so-so about Otep. Nothing forgettable, not one bit. Her on-stage presence is even more forceful--more in-your-face--than in the band's recordings (latest offering, "Hydra", available now). This was just the beginning of the tour: Sacramento was the opening night. You have a chance to catch them still. Even if you're in Australia. No excuses. The AoS was a fluid pit of mosh. I've never seen it like that before. Impressive. 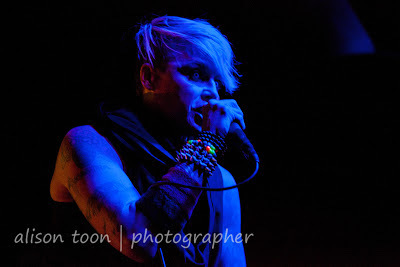 Otep's a vocal poet with the eyes of a demon (at least, on stage), and I hope--very much--that she'll come back to Sacramento for Aftershock, and show Mr Pro Photog how wrong he can be. In fact, I hope all four of these women (and their bands) will participate at Aftershock this year. I'm writing to the festival organizers--why don't you do the same?